PoPville » Dear PoPville – Killer Bees Ahead or Effective Clip Art? Dear PoPville – Killer Bees Ahead or Effective Clip Art? What does this Park Police line on the Beach Road hiking trail in Rock Creek Park mean? Was there a killer bee attack? 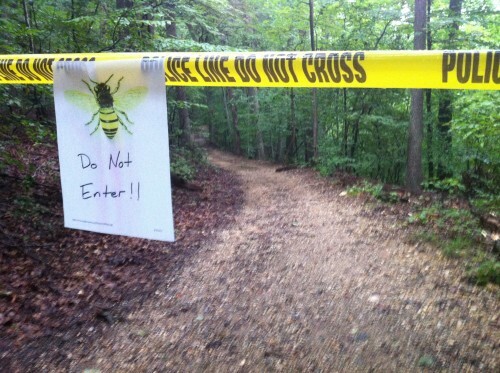 A hive down on the trail? Is the National Park Service spraying for bee parasites? Or was this just the most convenient clip art to stop people from walking along the ridge line path?